Served warm, lahanorizo is hearty and perfect for a winter’s night. A dish at room temperature (or even right from the fridge!) and sprinkled with a bit of fresh lemon juice is just the thing for a hot summer afternoon. Tasty, healthy, versatility is lahanorizo! Prepping your cabbage takes just a minute. Remove a few of the outer most leaves from the head and cut out the core with a sharp knife. 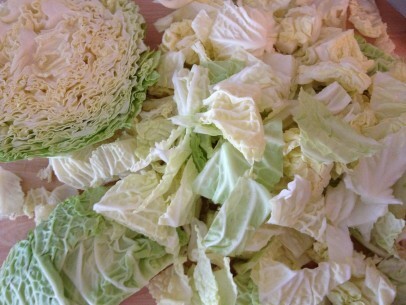 Then chop your cabbage into squares, not too tiny because it cooks down in size. The pieces should be a nice variety of medium to light green colors with some yellow and white. A 3 quart saucepan is the perfect size for this recipe. Make sure you have a snug fitting lid, whatever your choice of pot/pan. 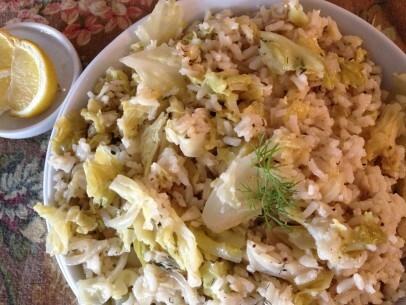 Most of this dish will be cooked on low heat, especially when you add the cabbage to cook down. Allowing it about 15 minutes to cook down at very low heat gives you such a sweet, tender cabbage it’s worth your patience. 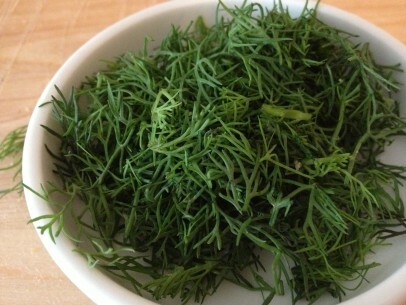 Fresh dill is important to lahanorizo and thyme is a lovely companion herb. The dill should be fresh and not dried unless in an emergency, the thyme can be either fresh or dried. I’ve had this dish with the thyme substituted with mint and also oregano (not mixed!) and they’re all delicious but thyme is my favorite. It always amazes me how a few, simple ingredients can turn into such a wonderful meal! Peel off and discard outer leaves of cabbage. Core,chop and set aside. Heat olive oil in 3 qt saucepan and gently sauté onions and garlic over low heat until soft and golden. Add herbs/spices, stir to combine well. Add chopped cabbage and turn down heat to very low. Cook cabbage, uncovered, for 15 minutes until cabbage has reduced about half. 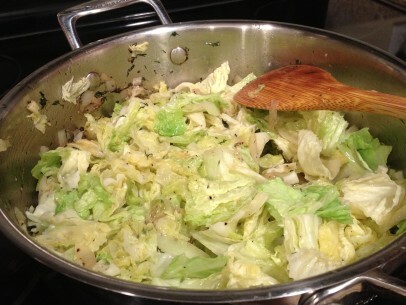 Stir cabbage about every 5 minutes while cooking, bringing the cabbage from bottom of the pan to top to cook evenly. 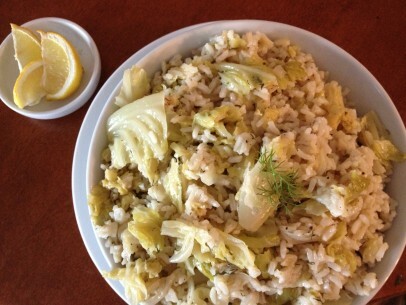 Add rice to cabbage mixture, stir well to combine and add water. Raise heat slightly to low and cook, covered, for 20 – 25 minutes until rice is done. Remove pan from heat and allow to rest, covered, for approx 10 minutes before serving. Add a fresh squeeze of lemon and a piece of crusty bread and enjoy. Miriam, how much olive oil? 1/4 C of Garlic? Really? Doesn’t that seem to be too much (even by garlic-loving Greek standards) in relation to the other ingredients? Was that supposed to be tablespoon? One of the favorite dishes in our home since I found your recipe! Greek food at it’s best, cheap, easy and healthy! This is also very good with toasted pine nuts or sauteed mushrooms. Put in a pita with Greek tomato relish or roasted pepper relish, so yum! What will happen if I use vegetable broth instead of stock ? Wonderful, easy, quick, versatile – a new favorite. Delicious as is and I’m already thinking about experimenting with different veggies, like broccoli or zucchini, as variations & for when I don’t have cabbage. Thank you!